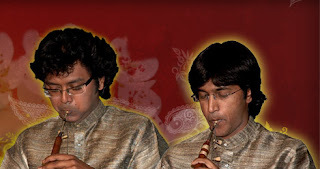 Born in a family of musicians of Banaras gharana in which Shehnai & flute are played for the last 450 years and over, Sanjeev & Ashwani manifested their strong affinity towards music at the age of seven and five. Their father Pt. Daya Shankar, himself an internationally acclaimed Shehnai player boosted his sons’ blooming talent to flourish with his personal inspiration and guidance. Sanjeev & Ashwani also had the privilege to learn Shehnai from their grandfather, the legendary Shehnai player Pt. Anant Lal .After formal training in pursuit of proficiency of the highest order in Raga, Taal and Laya, both were awarded scholarship by the Govt. of India, Department of Culture, for their outstanding talent in the field of music. At present Sanjeev & Ashwani have been consolidating their knowledge under the able guidance of the legendary sitar maestro Pt. Ravi Shankar . Ashwani is a Graduate in Political Science, and Sanjeev who is a Post graduate in Hindustani Classical Vocal music is presently doing research work for his M.Phil degree.Sanjeev has had the privilege to tour the U.S.A with Pandit Ravi Shankar for the Festival of India from 2005.In the year 2003, Sanjeev gave part of the background score and also played Shehnai in the film “Letters from Rishikesh” which was produced for the National Television of Israel. Sanjeev has recently arranged music in an album of Jain Devotional songs which was released by the honorable Swami Vidyanandji in the month of April 2006. The Shankar brothers have to their credit a wide spectrum of performances and have mesmerized the audiences at various music festivals like Sri Baba Harballabh Sangeet Sammelan, Magh Mahotsav, Sangeet Natak Akademi Music Festival , and also in places like Delhi, Calcutta, Bangalore, Allahabad, Lucknow, Poona, Gangtok, Mumbai, Chennai, Ayodhya in India , and have represented India on many international platforms in places like France, Spain, Ireland, England, Scotland, Hungary, Slovakia, Japan, Bangladesh, USA and many more to name. In all their performances the brother duo touched the hearts of the listeners worldwide and were critically acclaimed and praised by both, the exponents and the critics of the music world. Though its name comes from Persian, and though it can be compared to other Middle-East instruments like Zurna, Surna, etc., the instrument is itself very much Indian. If we break the word shehnai in two words, we get “Sheh” and “Nai” respectively. Sheh, or Shah, means the king and Nai or Na means flute, so this instrument can be regarded as the “King of Flute” or “King of Wind Instruments”.The presence of shehnai can be traced back to the Vedic era and before because of the description of shehnai like instrument can be found in almost all the earlier scriptures, including ancient Vedas, murals, and sculptures of Ajanta and Ellora and also in the Terra-cotta structures. Over the centuries, the instrument was given a different name for example while the Rig Veda called it the “Naadi”. The Matang in his Brihaddeshi calls it “Mahuvari”. Sharang Dev described it as “Madukari” and “Kahal” and in Ahobali Sangeet Parizaad one comes across the name “Sunadi”.However, this beautiful wind instrument got its present name “Shehnai” probably in the Mughal era. About 100 years ago, shehnai was basically a folk instrument and playing style was very limited. For example, the style included folk songs from north India especially thumri, daadra, chaiti, sohar, pujaiya, etc. and apart from these very few small compositions based on basic raga were rendered on shehnai but because of the efforts of the virtuoso like Ustaad Bismillah Khan, Pandit Anant Lal, Pandit Daya Shankar the dimension of shehnai playing was broadened with the introduction of new technique and style. It is solely because of the efforts of these masters that shehnai is considered a classical instrument on which almost any raga accompanied by any tala can be played with marvelous clarity, beautiful sound, and modulation, and it has become very famous Indian classical instrument.